Kerry's 'high hopes' amid poll crisis Jump to media player The US Secretary of State, John Kerry, is holding separate meetings in Afghanistan with the two political rivals who are both claiming victory in the recent presidential election. Kerry to hold Afghan poll talks Jump to media player US Secretary of State John Kerry arrives in Afghanistan to try to resolve tensions over the country's disputed presidential election. Empty streets of Pakistan 'ghost town' Jump to media player Pakistan's military takes the media to see Miranshah, formerly a hotbed of Taliban activity, three weeks into its offensive against militants in the region. Afghan blast: Four Nato soldiers dead Jump to media player A suicide bomber has killed 16 people - including four Nato soldiers - in an attack on the outskirts of Bagram air base in north-eastern Afghanistan. Ashraf Ghani leads in Afghan poll Jump to media player Ashraf Ghani is leading the race to replace Hamid Karzai as president of Afghanistan, according to preliminary results. 'Right to have election concerns' Jump to media player Electoral authorities in Afghanistan have said they want to delay any announcement by a week due to allegations of voter fraud. Afghan election result delayed Jump to media player Electoral authorities have said they want to delay any announcement in the Afghan election because of allegations of voter fraud. 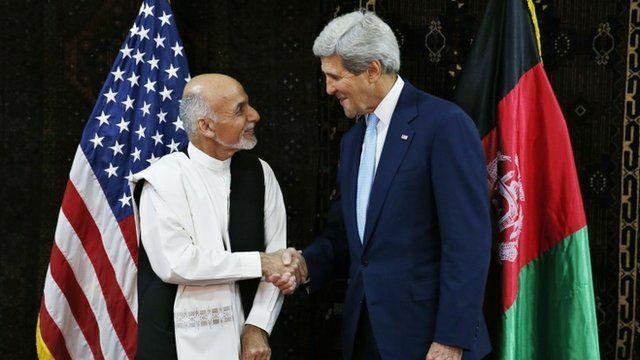 The US Secretary of State, John Kerry, is holding separate meetings in Afghanistan with the two political rivals who are both claiming victory in the recent presidential election. Abdullah Abdullah and Ashraf Ghani stood in a run-off in June with official results suggesting Mr Ghani was the winner. Current President Hamid Karzai is stepping down after more than 10 years. He took power following the US-led overthrow of the Taliban. Mr Kerry said: "I'm here because President Obama and the USA are deeply interested in a unified, democratic and stable Afghanistan."